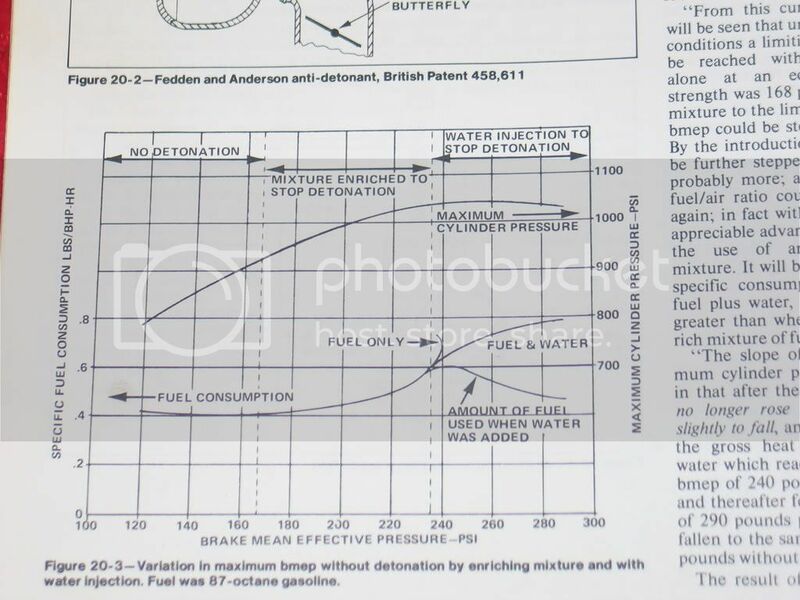 This graph shows how increase boost and fuel to the limit of power and added water injection to increase the Brake Mean Effective Power from 168 to 240 and also leaning the engine out to where he started. The fuel was 87 octane. The octane rating is a measure of the resistance of gasoline to detonation (engine knocking) in spark-ignition internal combustion engines. If the same test had been done with 119 octane racing fuel there may have been no difference with water injection. I really doubt if water injection can be of any help on a full pop racing engine. Water injection is used to lower the temperature of the mixture to avoid detonation. If detonation is limiting horsepower, there are other ways to prevent it. At the limits of racing engines I doubt if water would allow more horsepower to be achieved. My experience with water on a dyno is limited to diesels, but I haven't seen a gain at either the dyno or the dragstrip by turning on the faucet, unless you add methanol to the mix, which is just adding more fuel for us. This flies in the face of the advertising brochures, but so far I haven't figured out how to make more power with brochures, since they clog up the fuel filter. Stickers? SURE! i think it has some use.... kinda like a band aid.... So many people use band aids to solve a problem and in so create another problem.... in low boost applications (under 20lbs) it might be a cheep fix.... but IMO if your not using 30lbs boost its not a race engine! I don't think water injection makes more power... it might help with detonation or lower charge temp that will allow increases in performances but you should really be looking at the root of your problems instead of a quick fix... Just something else to brake! What it is really handy for on a high boost racing engine is to suppress high EGT's which can damage turbines. That's why I run it. But if you aren't over 1300 deg with an inconel turbine, you are OK without worrying about water. so, are you spraying it into the exhaust? No, I spray it in the intake. Drive pressure, high temps, and the risk of cracking plumbing scares me away from going directly into the exhaust. But someday I'd like to experiment. Spraying into the intake drops me about 150 F at the turbine with no apparent risk. During WW2 the airplanes had up to 115 octane and they still used water injection and as far as I know the unlimited airplane racers still use it ''ADI'' anti detonation injection. Notice how much Ricardo leaned the engine. Probably "The High Speed Internal Combustion Engine". This graph came from the book ''Turbochargers'' by Hugh Macinnes [HPBOOKS] quoting information from Ricardo's book. Great info in this book from learning how to figure boost temps, tubo sizeing ,tubo map reading ,tubo staging,intercooling and water injection. I really doubt if water injection can be of any help on a full pop racing engine. On a naturally aspirated motor you're probably right but forced induction applications almost always see a power increase. Water injection is used to lower the temperature of the mixture to avoid detonation. Actually, water is resistant to combustion (obviously) and you could even say that water has an infinite octane rating. Add in something that doesn't burn but does absorb a lot of heat energy and you effectively reduce the combustion rate of your air/fuel mixture. It's a "heat sink" if you will that helps to control combustion and not just cool the mixture directly. but forced induction applications almost always see a power increase. Thanks for the topic - it raises a question. Detonation aside, if water (only) is injected upstream of a properly designed air box (or into a scoop?) on a normally aspirated engine, can one expect a cooled air charge upstream of the carb/throttle body, and thus, a corresponding increase in density of the air/fuel mixture filling the cylinders?